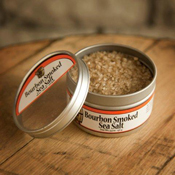 A delicious way to eat your bourbon! Sweetened with sorghum, flavored with bourbon, and seasoned with fresh ginger and garlic, our Kentucky-style teriyaki sauce is fabulous for glazing chicken breasts and shrimp, and makes great addition to stir fry. A delicious way to eat your bourbon! The slogan "Eat Your Bourbon" reigns supreme at Louisville, Kentucky-based Bourbon Barrel Foods. 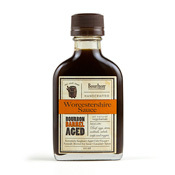 A leader in the bourbon and gourmet foods industries, and favorite of celebrity chefs and home cooks alike, Bourbon Barrel Foods' aged sauces, spices, and other culinary and cocktail products all draw on innovative uses of Kentucky bourbon barrels, and are crafted with care in small batches. Bourbon Barrel Foods began in 2006 as the only soy sauce microbrewery in the US, with founder and owner Matt Jamie teaching himself the art of soy sauce brewing through online research. 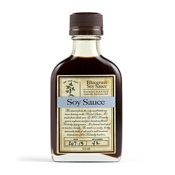 Bluegrass Soy Sauce remains the only soy sauce worldwide to be fermented and aged in repurposed bourbon barrels. 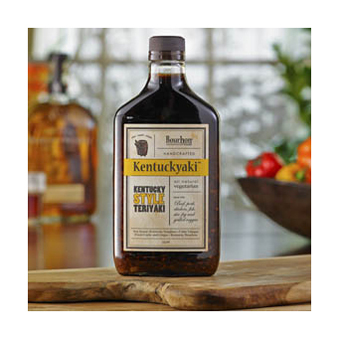 Aside from its unique and acclaimed Bluegrass Soy Sauce, Bourbon Barrel Foods offers an ever-evolving list of delicious bourbon-inspired products.